The 609 Main at Texas building was designed by Pickard Chilton. HOUSTON – (Realty News Report) – The White & Case law firm signed an 11-year lease for 57,315 SF at 609 Main at Texas, a 48-story, 1,073,075-SF office tower in downtown Houston. With the signing of this lease, 609 Main at Texas stands at 84 percent leased. The tower, which held its grand opening in May 2017, was developed by Hines. White & Case will occupy the 29th and 30th floors. The building’s other notable tenants include EnVen Energy; Kirkland & Ellis LLP; Orrick, Hogan Lovells, McKinsey & Company; Russell Reynolds Associates; Royal Bank of Canada; Goldman Sachs; and United Airlines. In addition, there are several transactions in progress which will bring the building to 93 percent leased, Hines said. Hines was represented in the lease by Michael Anderson and Damon Thames with Colvill Office Properties while White & Case was represented by David Bale with JLL. 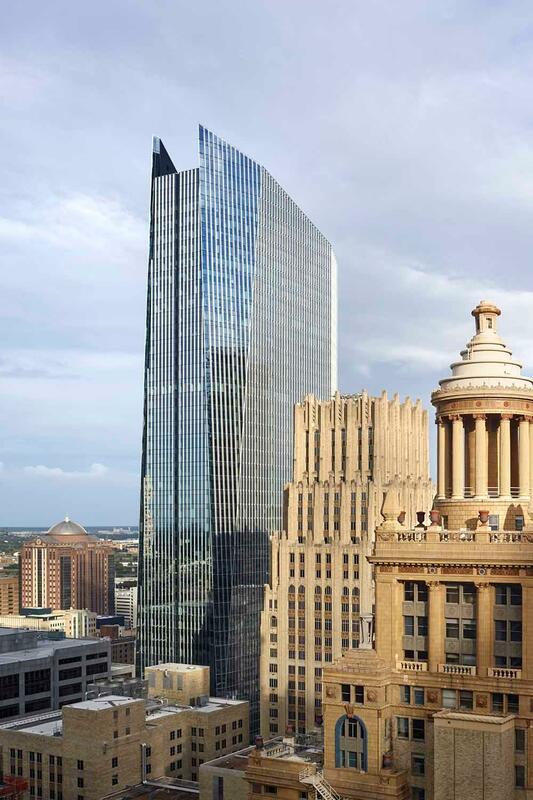 Designed by the Pickard Chilton architecture firm, 609 Main at Texas’ north and south façade extend skyward, culminating in a dramatic diagonal crown. 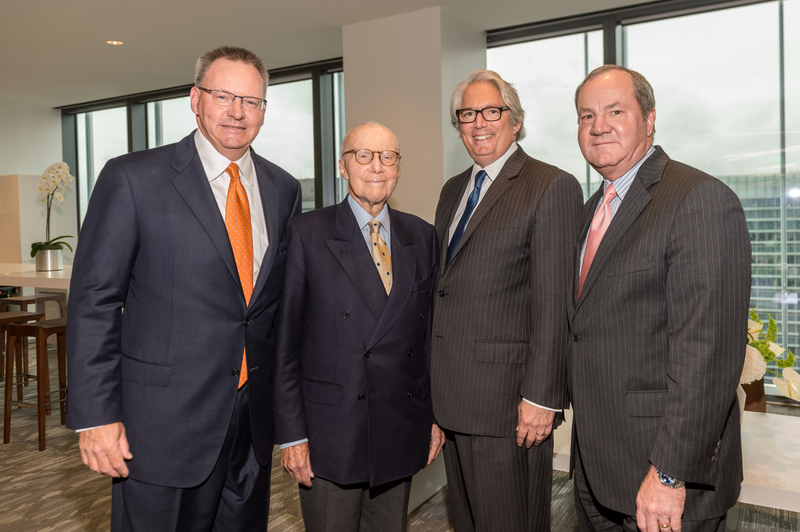 John Mooz, Mr. Gerald D. Hines, architect Jon Pickard and Jeff Hines at the 2017 grand opening of 609 Main at Texas. Amenities at the vertically integrated campus include a “hotel-style” lobby with a café and spaces for networking; a 7,000-SF fitness center and 8,000-SF conference center; full-height windows; a sophisticated underfloor HVAC system; and private roof gardens. White & Case is a global law firm with lawyers in 44 offices across 30 countries. The 609 Main building is the newest downtown Houston office tower completed by Hines, a Houston firm founded in 1957. The firm also broke ground last year on the 47-story Texas Tower on Block 58, which is the former Houston Chronicle site, a block bounded by Texas Avenue, Milam, Travis and Prairie. The Texas Tower building will be completed in 2021.